Fortunately, you can’t fool all the people all the time, and this pitiful effort fails to make a good case. Still, for the enlightenment of those who might be fooled, and the entertainment of the rest of us, I offer a little analysis of its failings. First, how does Williams’ syndicated column carry water for the Kochs? Williams is a professor of economics at George Mason University. But he’s also a “distinguished affiliated scholar” at the Mercatus Center, a “free-market” university-related “think tank” (at George Mason University). Mercatus Center was established with Koch brothers money and continues to be funded by the Kochs (along with Exxon Mobil and others). This means the economics department at George Mason is cranking out an endless supply of growth worshipping economists to keep the prosperity from growth myth alive. 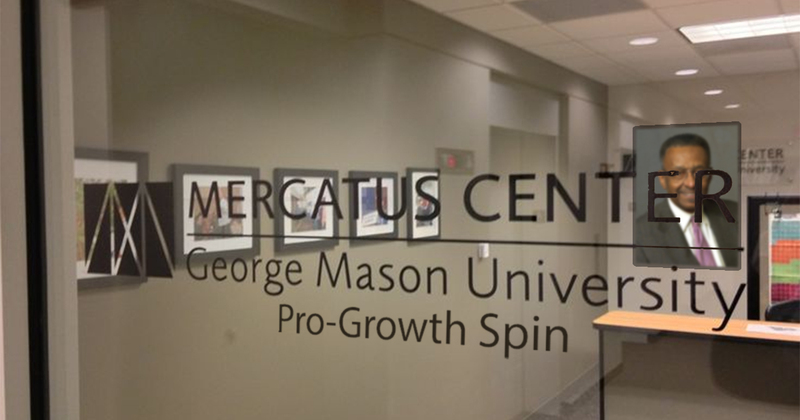 Interestingly, Williams’ website makes no mention of the Mercatus Center. The brief bio that accompanies his column also omits that. His bio at Creators Syndicate makes no mention of it, though it does indicate Williams is a fellow at Heritage Foundation, which played a major role in shaping the Trump transition team. Heritage and the Kochs are probably connected via Donors Trust, a donor-advised fund that keeps donor names private. I’m not sure why his connection with Mercatus is kept quiet. Draw your own conclusions. Second, let’s run the piece through the propaganda and spin detector. I think the jury is still out on that one. Oh my, isn’t that terrible? Billions spent to try to avoid the mass starvation predicted by Malthus and Ehrlich. Gee, maybe that’s why it hasn’t been a bigger disaster, so far. 3. Amusingly, Williams uses a list of regions with both “population density” and high gross domestic product, comparing that with regions that have low population density and low GDP. There are a number of problems with this. GDP is not a measure of well-being, and doesn’t guarantee there will be no starvation. In fact high GDP could result from massive expenditures to keep increasingly expensive energy, water and food flowing. That is no guarantee that supplies won’t be effectively exhausted. In fact it is accelerating the depletion of numerous resources. Let’s do our best to speed and spread the truth. 5. Williams goes on to make the tired case that humans are innovators, so we need more of them if we want continued progress. Apparently 7.5 billion is not enough, even though we were far fewer than a billion when we harnessed fire, invented the wheel, and began domestic agriculture. We were, however, over 6 billion before we invented the phony “think tank” to spread propaganda for growth profiteers. They probably consider that highly innovative! The growth profiteers and spinmeisters pushing the Koch brand of “freedom” are shooting that liberty in the foot as they implore us to ignore the perils of overpopulation and get busy breeding more innovators (in truth, cheap labor for their production lines and consumers hungry for their products). It’s pretty damn obvious, but let me put it very simply. The more crowded the planet, the more regulation we’re going to need. In case you were wondering, yes, I felt innovative, so I took some creative “freedom” with the photo of the front door to the Mercatus Center. I have a copy of Malthus’ essay. I searched every occurrence of “starv”. Malthus didn’t write “mankind’s birthrate would outstrip our ability to grow food and would lead to mass starvation”. The point that Malthus made was that population growth would prevent the eradication of poverty. Malthus has been proven correct every day of every year from the time that he penned his essay until the present moment. Poverty persists. Walter E. Williams and his ilk are either dishonest or ignorant. As a person privileged by access to the scientific discoveries made in the 200+ years since Malthus wrote, I can say this: Malthus was far ahead of his time and Williams is somewhere in the back of beyond biblical time. The Koch-paid article analyzed here is an example of academic dishonesty and prostitution. Yes, and it happens multiple times daily.